Growing up with smartphones and tablets gives younger people an obvious advantage when it comes to technology. For example, if you were to grow up learning the French language it’s very likely that if you needed to learn some new French words it would be a doddle! Whereas, for an older person who has never spoken French it would be more difficult and they may take a little longer picking it up. Technology is similar; If you grow up with a mobile phone in your pocket at all times, and spend your days on a computer or tablet endlessly scrolling through social media it becomes second nature. If you were to be given a mobile phone for the first time, having never even dabbled with technology, you may not find it quite as easy. But, that’s not to say that your elderly loved ones wouldn’t benefit from the use of technology, we definitely encourage investing in a tablet or smartphone! Technology can help us stay connected – to the world, to family and friends and to current affairs – so a small piece of technology could make a world of difference to an older person. What are the best Smartphones and Tablets for the Elderly? 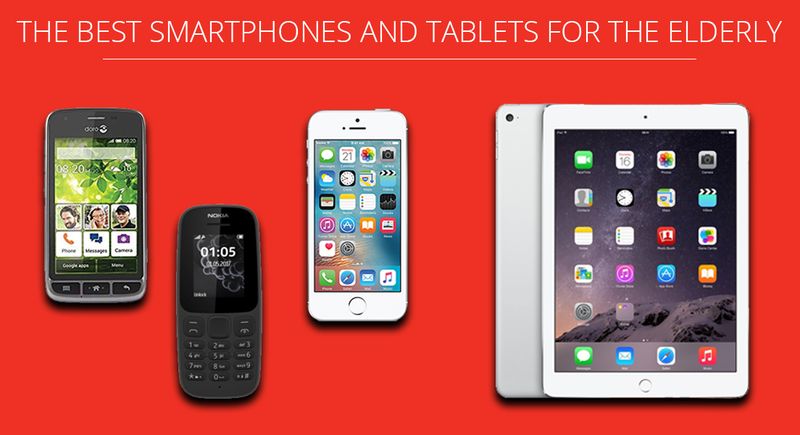 There are many different smartphones and tablets on the market currently so, where do you start? And, what are the best smartphones and tablets for the elderly? Well, some key things to consider are screen size, sound quality, zoom ability and easy navigation. The phrase ‘my eyesight (or hearing) isn’t as good as it used to be’ is something to keep in mind. You may find reading on a tablet relatively simple but your elderly loved one may struggle – so make sure you’re mindful that everyone experiences things differently. Simple interface – Smartphones and tablets often offer app after app with hundreds of different features and they can seem complicated to use. Look for something with a simple layout and interface. Your loved one is most likely going to want to use the device for making calls, texting or browsing the internet; make sure these functions (along with the phone contacts) are easily accessible. Large Screen – Your loved ones are going to want to look at photos; photos of you, photos of your children, photos of beautiful landscapes – no matter the subject matter they’re going to want to look at them, which means a large, clear screen is a must. This will also be an advantage when it comes to reading texts or finding phone numbers. Through all the things we gain as we age, sadly, better eyesight is not one of them. Lightweight – Whichever device you choose, it’s going to be carried around with your loved one so it needs to be portable and reasonably lightweight. Tablets are generally bigger so try to look for something lighter to balance out the larger size. Smartphones can be heavy due to their batteries and processors, but there are lighter options on the market so keep an eye out for those. Larger screens can mean bigger devices, but go too big and your loved one won’t want to take it out and about with them! We’ve taken a look at the most accessible and user friendly smartphones and tablets on the market to make your life easier. Apple iPads are popular with all ages because of their simple interface, large clear screens and light weight body. An iPad Air is a great option for your loved one as it’s even lighter than the original model, weighing in at under 500g. The main attraction with the iPad is the retina screen which makes it much easier on the eye and offers crisp, bright and clear images and text – ideal for an older person. The iPad has a good amount of memory (depending on which model you choose) which means you’re loved one can download new apps, take photos to keep in the photo library and add films and music to the tablet if they desire. Apple iPad’s are on the pricier side (as most Apple products are), but you can get your hands on an older model of an iPad for as little as £200.00. The Samsung Galaxy Tab A comes complete with a large 10.1″ screen and is extremely thin and light for it’s size – which makes it perfect for taking out and about with ease. The lightweight body comes with a long 13 hour battery life and the bigger screen ensures those with poorer eyesight will have no trouble reading emails, texts or surfing the web. The screen resolution is excellent and the colours vivid, so if you’re looking for something that your loved one can also use to watch TV or films, this is the tablet for you. The tablet also has the option of a magnetic cover which doubles as a stand, so the tablet can easily be stood up for ease of use. Depending on the model you go for, this tablet is around £200.00, but there are smaller options available at a cheaper price! The GrandPad is a tablet designed specifically for elderly people. There are no passwords, pop ups or confusing interfaces; everything is designed with complete simplicity so instead of complicated apps and programs you do things like tap a photo to make a video call or tap a single button to send a voice message. The GrandPad is designed to keep older people in touch with their family, and comes with an accompanying app – the private family network – which can be downloaded on smartphones which family members can use to stay in touch with their elderly loved one. The device itself has a bright clear screen and is designed to be as comfortable and ergonomic as possible. You may not have heard about the GrandPad yet as it’s currently only available in the US; but the company have said they do have plans to eventually go international. The Doro is heavier than your average smartphone but will feel robust and good quality, and means that if your loved one accidentally drops the phone it probably won’t damage it! There are three buttons on the front of the phone – uncommon with most these days – and on the reverse of the phone is an assistance button which can be customised to the owners preference to do a number of things. For example, the button could be pressed to call a specific person or the emergency services – a great option for when your loved one is out and about and not able to wear their Careline pendant! The iPhone SE is one to consider for older people or smartphone newbies in general. An iPhone’s settings can be customised to make text larger and volumes louder, colours can be changed and Siri is a really helpful feature for someone who needs help as they go along. “Siri, is the iPhone easy to use?” the iPhone can take some getting used to, but if your loved one is up for learning then it could help them stay connected with you, take high quality photos, download apps, play games, watch TV and stream films. The only downfall with the iPhone is its price, it starts at prices of over £300 so it’s worth thinking carefully before purchasing one! Nokia are well known for their classic 3310 which was big in the 90s, it was durable, had a customisable shell and a very long battery life – and the 105 isn’t much different. It’s not specifically designed for the older generation but does have features which makes it a perfect match! As previously mentioned, the phone is extremely durable – there are no touch screens here, the build is sturdy and the face of the phone has a smaller screen and buttons. It has a long battery life which is perfect for an older person who may forget to charge it regularly, the interface is simple, it has very basic functionality but does everything it needs to do. Your loved one won’t struggle to call you but there is the issue of texting with the number buttons rather than having letters all laid out separately. The phone doesn’t have a camera, or connection to the internet but for some that’s not a problem. If you’re looking for something affordable and that your loved one can call you on when they’re out and about, the Nokia is for you! Whilst a smartphone can be essential for calling for help whilst your loved one is out and about, while they’re at home a Careline alarm is a fantastic option. Our alarms are designed to help elderly people stay independent and safe in their own home. The alarm button can be worn around the neck or on the wrist and pressed when assistance is needed, our helpful care team will then arrange for assistance in the form of family, friends, neighbours or the emergency services. For more information on our Careline alarm, you can contact our friendly customer services team on 0800 101 3333 or visit our contact page.